The Tiny Skillet: Super Bowl Tailgating Time! This is it...the final Tailgating Time of the season! - The good food continues, so keep those dips and party treats coming, and a pitcher full of cold ones! It's Super Bowl time! Bring over your famous recipes for you favorite foods and party things! Thank you all who joined in all seasonwe had a ton of great food! Welcome those of you who are new to us!! Come on and have some fun! it's easy, just add your recipe to the linky, and link back to us! 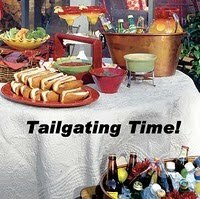 to add it to your own Tailgating Time post this week, the more the merrier! Lyndz, is this the last Tailgating Time event? Wonderful recipes!!! I would love to try the basil-bean dip. Hi Lindsey, I'm bringing Fruit Tea to share with everyone this time.